On Thursday this week (1/17/2019), I sold my my house in Laurel. This marked the end of a 12 year story that began in June 2006, when I bought the house for 355K just before the house bubble burst and the financial crisis hit. The story has been full of ups and downs, many happy and some not so happy moments. Financially, the house was a big loss. 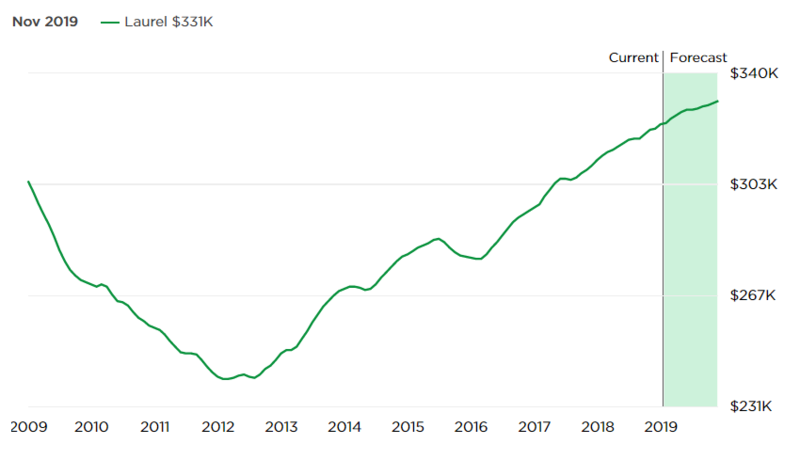 Despite its proximity to DC and Baltimore, the housing market in the area my house is located never fully recovered from the collapse of housing prices in the financial crisis. After 12 years of ownership, I ended up selling it for 335K, with a significant closing credit for the buyer. In this blog, I’ll describe the high and low points of my journey as a home owner and the lessons I have learnt from this experience. 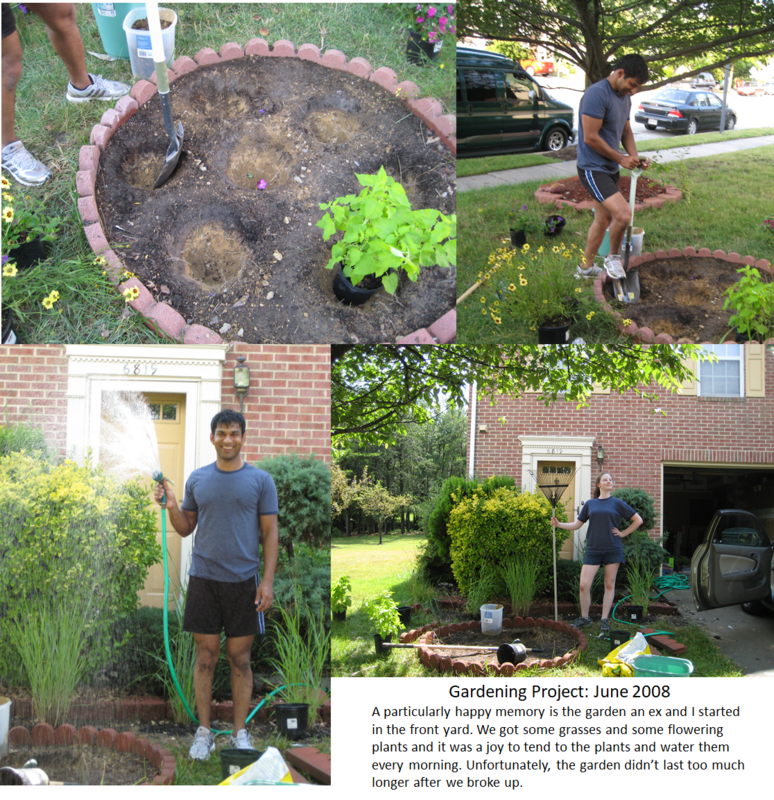 The blog is split into two sections – the first tells my story of being a homeowner. The second provides general information about real estate mixed with my own experience. You’ll learn about how the process of buying and selling a house works, transaction costs involved, whether or not to get an agent, components of your mortgage payment and many other topics. I conclude the blog with my thoughts on home ownership and some recommendations on what to consider before buying a house. I hope you will find this information entertaining and useful. Please leave a comment if you do! Do I need to hire an agent? In 2006, the housing bubble was still getting bigger. Driven by loose bank lending standards and rampant speculation, housing prices had been rising inexorably over the last few years. The general thinking was – “buy now, otherwise it will only be more expensive next year. You can always sell at a profit later”. I bought into this herd mentality. Financially, my situation was stable at the time – I had a decent job at a company in Greenbelt. There were also some cultural factors at play – owning a house is considered a point of pride, of “having made it in life” in many Indian families. However, there was no compelling need to buy a house. I didn’t have a family and had no particular urge to be a homeowner. I was still on a work visa in the U.S. at the time and even my ability to stay in the country was not secure. I certainly didn’t know what I was doing – at that time, I didn’t really understand finance or economics, interest rates, the importance of location, demographics, taxes and many other issues that arise when one becomes a homeowner. Having made the decision to buy, I hired my friend Sara Glickman, who I had met ballroom dancing at the University of Maryland and had been friends with for many years. 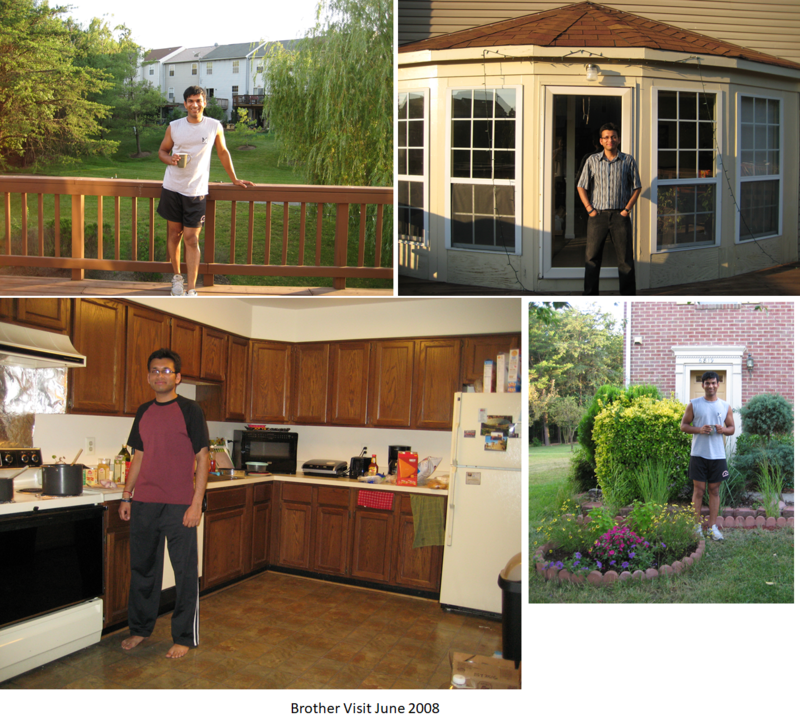 We looked around a few houses in Beltsville, Greenbelt, Laurel and few other neighborhoods. We made offers on a couple of houses but were outbid as the housing market was still hot at that time. I don’t remember the day we visited the house that I eventually bought, but I remember exactly what I liked the most about the house. The house is a 3-level end unit townhouse with a master bedroom and two small bedrooms on the top floor, living room and dining room on the middle floor and a family room on the bottom floor. The house had two full baths and two half baths (I later converted one of the half baths into a full bath). The living room and kitchen have four large windows looking over a spacious deck. During the day, sunlight streams in through the windows and creates a bright, warm and cozy feeling (see picture below). The house also has a nice fireplace in the basement. We made an offer on the house, our offer was accepted and the rest of the process went smoothly. The interest rates were quite high at the time and my loan had an interest rate of 7.375%, resulting in a monthly payment of over $3000. My take home pay after taxes at the time was around $5000, and thus my payment to income ratio was well over 50%. That was all ok under the loose lending standards of that time. I doubt I would be approved for a mortgage under the same terms today. I lived in the house from 2006 – 2011. While I was living in the house, I had two of the smaller rooms rented out. From a cash flow perspective, I was doing well with a couple of renters. My monthly mortgage (including real estate taxes) was around $3000, and I was getting about $1100 in rental income. With the additional ~$400 a month in tax savings due to the mortgage interest and property tax deduction, I was paying about $1500 net, out of which ~$350 was going towards building equity in the house. The first few years of home ownership were delightful. 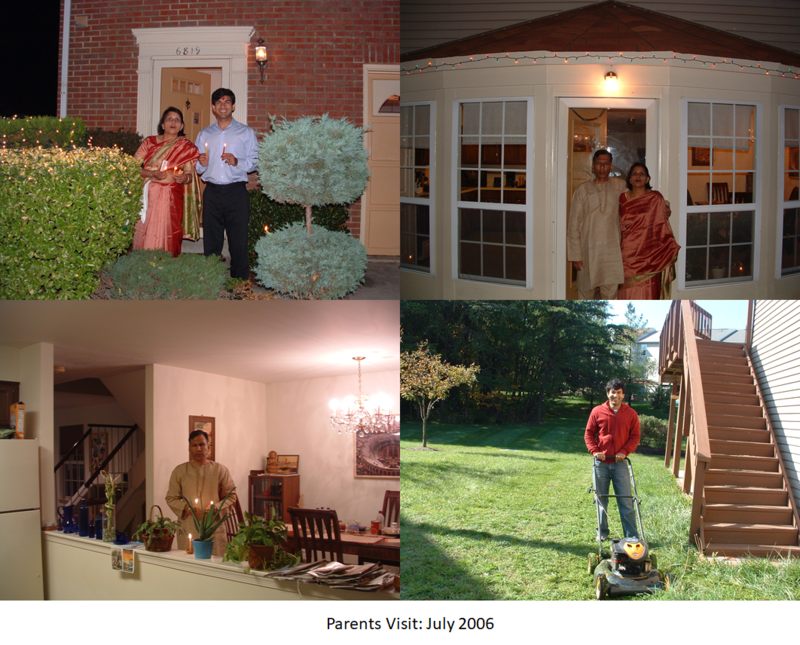 My parents visited later in 2006 and I felt proud to host them in a house I owned. I hosted my 28th birthday at the house. My brother lived in New York at the time and would come over every few months and we would host dinner parties for my friends. 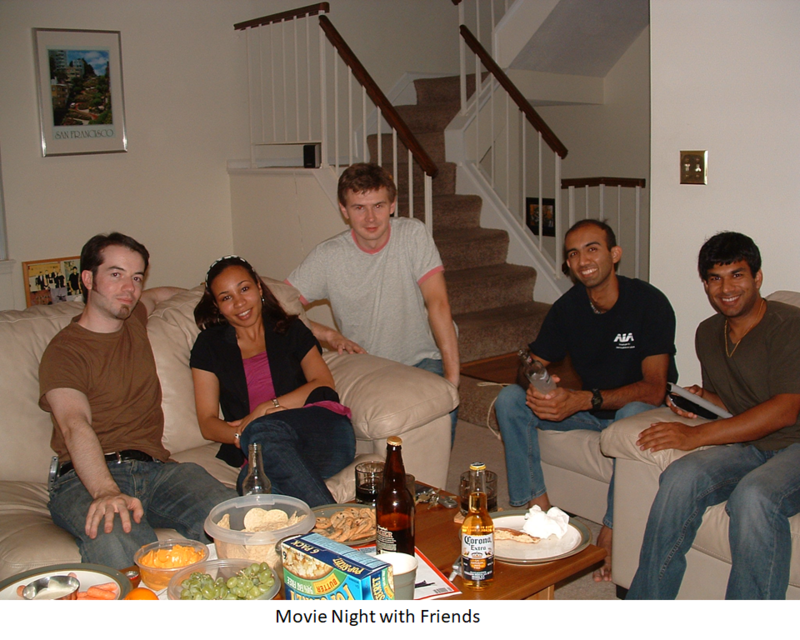 I organized many movie nights around the fireplace in the winter. I started a small flower garden in the front yard. 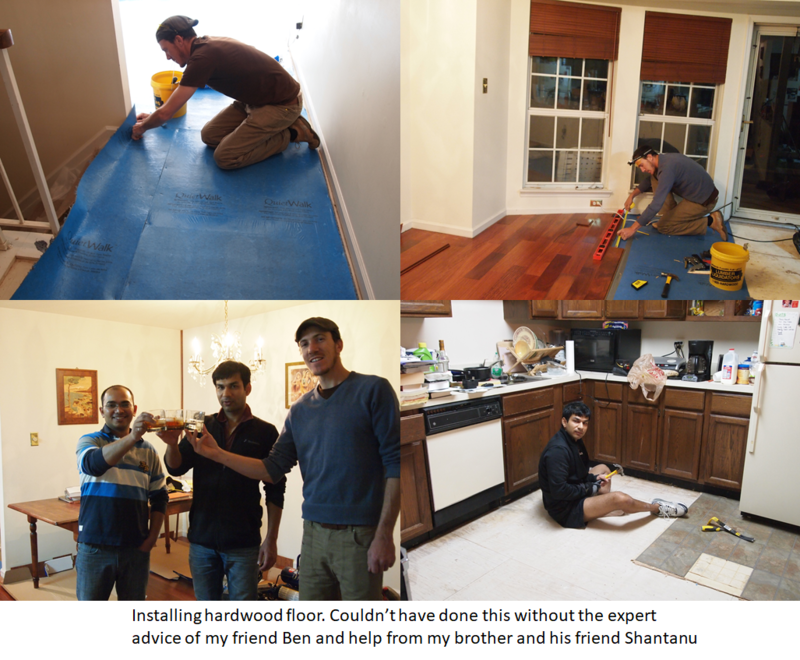 I also took on some home improvement projects, the biggest of which was replacing the carpet in the living room and master bedroom with hardwood floors. My friend Ben Googins and my brother and his friend played a vital role in this project. Some pictures are shown below. In 2009, I thought it would be a good idea to set up a gym in the family room. I bought a bench press, treadmill and an elliptical machine. 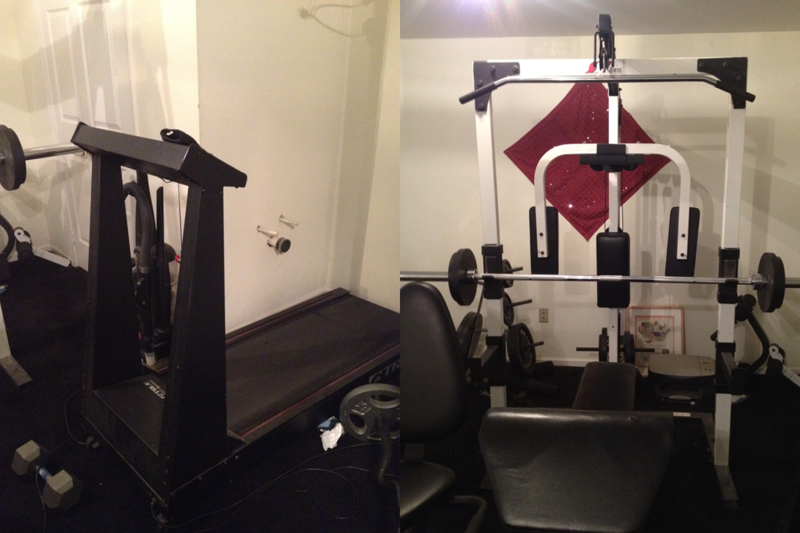 I used the gym for about a year or so and then it turned into what most gyms do – an expensive coat hanger. I eventually sold the gym equipment and put the elliptical machine in the garage to rent out the family room. The house was almost equidistant from Baltimore and DC. Without traffic, it took about 40 minutes to get to Baltimore or DC. Laurel is a typical suburb, it is designed for family living and doesn’t offer much for young single people other than a race track and a few semi-decent restaurants. Most of my friends lived in DC and VA and I was going to DC 2-3 times a week for socializing. Driving back to Laurel after a night out in DC was never a fun thing to do. When you are young and single, it is not a good idea to live too far from where you hang out, if you can help it. The financial crisis hit soon after I bought the house and housing prices across the country plummeted. Housing prices in Laurel took a particularly bad hit as the chart below shows. At one point, my house was worth less than half of what I had paid for it. This was both a blessing and a curse. The house, my biggest investment so far took a huge hit, but since I had not accumulated any significant savings at that point and was just starting to make more money and investing in stocks and bonds, I was able to start a retirement account and buy stocks at bargain prices. The financial crisis resulted in huge financial hardship for many people across the country. Housing speculators, who had bought overpriced properties aiming to sell them at a profit were now stuck with these properties. There were defaults and bankruptcies everywhere. Not only among ordinary people, some of whom were greedy and perhaps deserved it and some who were duped by unscrupulous lenders but also among the bigwigs in the finance, who should have known better. The story of Lehman Brothers and Bear Sterns are well known. With the stock market in a tailspin, Congress finally stepped in with a massive federal rescue of the finance industry, which had seized up and was threatening to take the broader economy down with it. The Troubled Asset Relief Progam (TARP) was passed injecting huge amount of federal stimulus into the economy, pseudo government lenders Fannie Mae and Freddie Mac were put into conservatorship and some wall street banks (eg BoA) were rescued while others were allowed to go under. Mindful of being labeled as “protecting the fat cats on wall street but not helping the little guy on main street”, the government also made it possible for ordinary people to refinance their mortgages. The issue with refinancing was that many people (including me) had bought houses before the crisis hit when mortgage rates were high. After the crisis, both housing prices and interest rates fell dramatically (housing prices fell for obvious reasons and interest rates fell because the federal reserve aggressively lowered rates to stimulate the economy and rates established by the fed is the floor for all other types of lending). Under normal conditions, homeowners can take advantage of lower interest rates by refinancing their mortgage. This however requires a certain amount of equity in the house. After the financial crisis, refinancing wasn’t possible because house prices had fallen so much that most people (even those who had owned their houses for many years) had zero or negative equity in their homes, meaning that they owed more than what their houses were currently worth. This pathological situation created a double whammy for home owners who were stuck with overpriced homes that they couldn’t refinance. Many people simply walked away from their homes and declared bankruptcy. These empty, unkempt homes with unmowed front yards further depressed home prices in their neighborhoods and added to already huge number of mortgage defaults creating further difficulties for banks. Decline in home prices also had an indirect side effect on workforce mobility. Unable or unwilling to sell their houses at a significant financial loss, many otherwise financially responsible and solvent people were locked-in to their geographical area. This lowered workforce mobility creating a further economic headwind. I can personally attest to this – I didn’t consider numerous job opportunities in Boston, San Francisco and Seattle because I felt that I couldn’t move out of the house. The government finally stepped in and created the HARP program to help borrowers who remained current on their mortgages, and had loans owned by Fannie Mae or Freddie Mac to refinance their mortgage and/or move from an adjustable rate to a fixed rate mortgage. I was able to take advantage of the HARP program to refinance my mortgage from 7.375% to just under 5%, which lowered by monthly payment from >$3000 to ~$2500. This helped a lot with monthly cashflow, however I still felt locked-in to Laurel. In 2010, I started an evening MBA program at Georgetown University. I had evening classes twice a week and had to drive from Greenbelt where I worked to the Georgetown campus in DC and then back home to Laurel after classes, getting back home around 10:30 in the night. Plus, I was in DC at least one other night a week for socializing. It made sense for me to move to DC or VA, but I was scared of doing so because I didn’t want to leave the house entirely to tenants. I already had two tenants, but I was reluctant to rent out the entire house. I worried about how they would treat the house. This worry kept me living in the house for at least an year longer than I should have. Finally, after discussions with my family and friends, I decided to “take the plunge” and moved out of the house and rented out my own master bedroom. At this point, I had the master bedroom and the two smaller rooms on the top floor rented out. I didn’t rent out the family room at the bottom level as I wanted to have a place to stay in case I had to move back. The bottom level also only had a half bath making it difficult to rent out the family room. After a couple of years, when I became more comfortable with renting out the entire house and realized that I only spent a couple of nights back in the house over two years, I decided to convert the half bath into a full bath and rent out the family room as well. This cost me about 6K upfront but turned out to be a great investment and more than paid for itself in additional rent. Finally, in 2018, almost 8 years after moving out of the house, I decided to sell the house. Many factors contributed to the decision. House prices had finally clawed their way back up and while the house was still worth about ~20K less than what I had paid for it (lesser, if you adjust for inflation), the mortgage balance had also come down and it was possible to sell without owing any more money to the bank. There had been a number of sales in the neighborhood at reasonable prices, particularly a directly comparable house across the street from my house. The long economic expansion that began after the end of the financial crisis was finally sputtering with increased volatility in the stock market and political instability. The fed had slowly been raising interest rates, which puts a downwards pressure on house prices by making it more expensive for people to get mortgages. 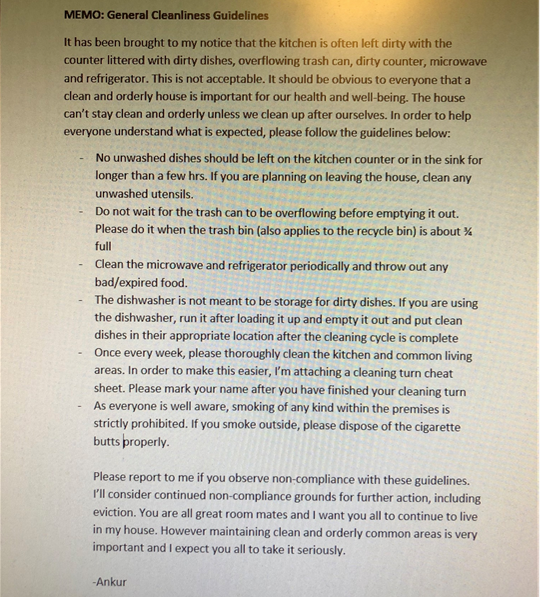 I was getting older and tired of dealing with tenants (I’ll write about the experience of being a landlord and lessons learnt in a separate section). More importantly, the opportunity cost of time spent on dealing with the house was rising every year. I had finally discovered Artificial Intelligence, the field I wanted to focus and spend the rest of my career in and I wanted to spend time learning about AI, focusing on AI related projects, writing blogs, giving talks, going biking, spending time with loved ones and doing other productive things instead of making mind-numbing trips to Laurel and dealing with tenant issues. The last straw was a particularly difficult tenant who I had to take to court to evict. This caused me months of headache. Finally, after this tenant moved out, I hired my friend Sara Glickman again and put the house on the market. A number of steps had to be taken before the house could be put on sale. I asked the remaining tenants to leave, hired contractors to fix many issues inside and outside the house, got the walls painted, cleaned out the garage and got a gardener to spruce up the front yard. On Sara’s advice, I paid for stagers to bring in nice furniture and make the house look cozy and inviting. 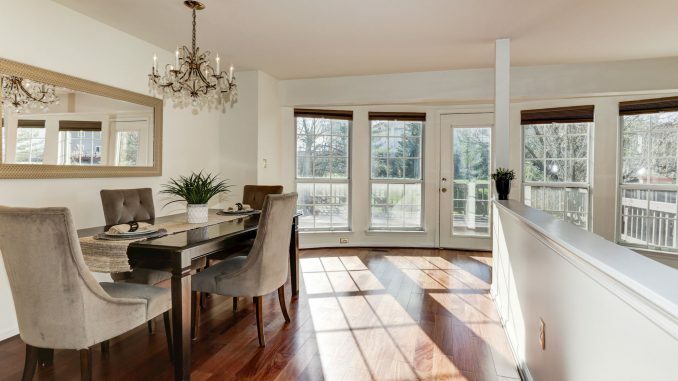 I’m not sure how much this actually helped, but staging definitely has benefits – pictures of a staged house look better (and thus attract more attention online), it makes the house look bigger and helps potential buyers imagine the house’s potential. Since purchasing a home is as much an emotional as a pragmatic experience, the additional eye candy can push an undecided buyer into making an offer. Overall, I spent ~11K on repairs and staging. Since there wasn’t any rental income coming in anymore, I wanted to sell the house as quickly as possible. Clearing out the garage. Three such truckloads were ultimately needed to clear out everything. I had tenants throughout the time I owned the house. I had the two smaller bedrooms rented out while I was living in the house. When I moved out, I rented out my own master bedroom and then later the family room in the bottom level as well. I don’t have an exact count, but I must have had >30 tenants in the 12 years I owned the house. Being a landlord teaches you a lot about human nature and about yourself. The tenants ranged from all races, gender, age range, professions, and length of tenancy. Some were in the house for less than a month, and the last tenant to move out had lived in the house for more than 5 years. In the first few years, I used to get many students at UMD. For some unknown reason (perhaps due to construction of more apartments near the UMD campus), the supply of UMD students largely dried out in the later years and majority of the tenants were working professionals in and around Laurel. One thing that constantly surprised me was the amount of new housing construction (both apartments and single family homes) that occurred in the area around my house despite the fact that not a single new company moved into the area since I bought the house. One reason could be the completion of the Intercounty Connector (ICC) highway around 2010 that connected PG county with Montgomery county and made it possible for people to live in Laurel where housing was cheaper and work in Rockville, Silver Spring or Bethesda. The Laurel area also hosts two large employers – the NSA and Johns Hopkins Applied Physics Lab, both steady sources of relatively highly paid employment. To find tenants, I advertised the house on craigslist. The vast majority of the tenants I found responded to my ad on craigslist. It usually took about 2 months to find a new tenant. My general feeling is that it became progressively harder over the years to find good tenants, though it never became too hard. There was also some deterioration in the quality of tenants. In the first few years, most tenants were UMD students or people with professional jobs. This shifted to lower paid jobs in the later years. The tenants were surprisingly price sensitive. You may think that renting the master bedroom or the family room downstairs (which had their own full bath) would be easier than the two smaller bedrooms that shared a bathroom. However, it was usually easier to find tenants for the two smaller bedrooms as the rent was around lower by around $130 . I barely raised the rent in the 12 years of being a landlord because raising the rent usually meant waiting for much longer to find a tenant. It was also usually difficult to pass the full cost of the utilities to the tenants. Most would only agree to a fixed contribution to the utilities leaving me on hook for the balance. This often became an issue in the middle of summer and winter when the heating/cooling usage was much higher. I was always nervous about how large the electric bill would be in the winter. I asked all tenants to sign a lease. I pulled a sample lease from the internet and customized it to my purpose. Initially, I trusted my instinct in picking tenants. After making some disastrous decisions (the last straw was an ex-military guy who lasted for less than 15 days. He never paid any rent, smoked weed in his room and stole money. I had to call the police to kick him out), I lost faith in my own judgement about people (and have yet to recover it) and started doing background checks. I used Transunion’s Smartmove for these background checks. Prospective tenants received an email from Transunion to provide their social security and other info and consent to the screening request. The background check pulled their credit and searched criminal and eviction records for any matches. I received a report with all of this information. There was a $40 fee for the service, which I asked the prospective tenant to pay. If all was good, I then deducted the cost of the background check from their security deposit. These background checks were very useful in screening out bad tenants. I was often surprised by what was in an applicant’s credit report. People who “looked good” at a first glance often had a highly irresponsible payment history. Being a landlord takes time, is often frustrating, will sap your energy and test your patience. With few exceptions, other people will not treat your house as you will. Don’t become a landlord unless you fully understand what it will involve. Don’t rely on your instincts about people too much. You’ll often be wrong and the cost of being wrong and letting a bad person in can be high. Trust only facts. Make sure to do background checks. Look at a person’s credit history. A pattern of delinquency is likely to repeat itself. Sometimes people have a good reason for poor credit – a divorce or foreclosure but those should be isolated incidents in an overall history of responsible credit behavior. Make sure to get employer and past landlord references. People who can’t provide these usually have something to hide. Never let anyone in unless they have signed a lease and paid the security deposit. I let in a few tenants before they had signed the lease. This turned into a big problem with the last tenant who had to be evicted by court order. She never signed a lease once she had moved in and lack of a signed lease turned into a problem when I went to court. Understand the landlord-tenant laws in your area. Some states are landlord friendly, while others are tenant friendly. Maryland is a tenant friendly state and makes it difficult and time consuming to evict tenants. I was fortunate that most people who lived in the house were nice and responsible. Some didn’t pay rent in time, but were otherwise responsible. Some were messy and left dirty dishes in the sink and stuff lying around in the living room. Others were very clean and were bothered by the mess created by other room mates. Since I was the ultimate arbiter of tenant disputes, I sometimes had to mediate and set rules when things got out of hand. I never had pets growing up. My first time living with a pet was when a girl moved in with her cat. This cat wasn’t very well behaved. It would scratch on the furniture and regurgitate grass balls on the carpet. I stopped allowing pets after this experience. One girl rented one of the smaller bedrooms, but brought in so much stuff that it filled all the closets and her bags were still lined up along the hallways for many days. She was delinquent in paying rent and I had to ask her to leave. The last roommate, a guy from the Czech republic lived in the house for over 5 years, always paid his rent in time and helped fixed issues around the house (he once fixed a washing machine that the specialist from Sears couldn’t fix). He was however a smoker and I had to remind him that smoking inside the house was strictly not permitted. One girl invited a band into the living room on her birthday party. She never told me she was planning on doing this. I came home from work to find couple dozen people in the house dancing to a rock band. A guy from Africa who lived in the master bedroom for a few months and stopped paying rent. I asked him to leave. He vacated the room but left many of his rather nice clothes in the closet. I donated the clothes to salvation army. I never understood why he left his clothes, particularly if he was low on cash and couldn’t pay rent. The worst experience was having to hire an attorney and going to court to evict one of the last tenants – an elderly woman who didn’t pay rent and stopped responding to my messages. The story is long and complicated, but this was the last straw for me that made up my mind to finally sell the house. In this section, I’ll summarize the process of buying and selling a house. I hired my friend Sara as my realtor when I bought and sold the house, but many people act as their own agent to save on transaction costs. Taking this route may save you money, but you’ll have to invest time in understanding real estate law and practice and the transaction may take more time. I wouldn’t recommend a first time buyer to go without an agent unless you really know what you are doing. Prepare the house for sale. If you live in the house, make sure the house is presentable. If you are renting out the house, you may want to ask your tenants to vacate to make it easy logistically. Otherwise, the tenants can stay but have to be o.k. with prospective buyers taking a look around in their absence. The presence of tenants may deter some buyers. Many states have regulations that require you to offer the house for sale to the tenants first before putting it out for sale to the public. I asked my tenants to vacate to make the logistics easier. You (seller) may hire stagers, depending on how the house looks. My agent told me that staged houses sell faster and for more money in her experience. The cost of staging depends on how many rooms you stage, how big the house is, whether the stagers can use some of your own furniture etc. 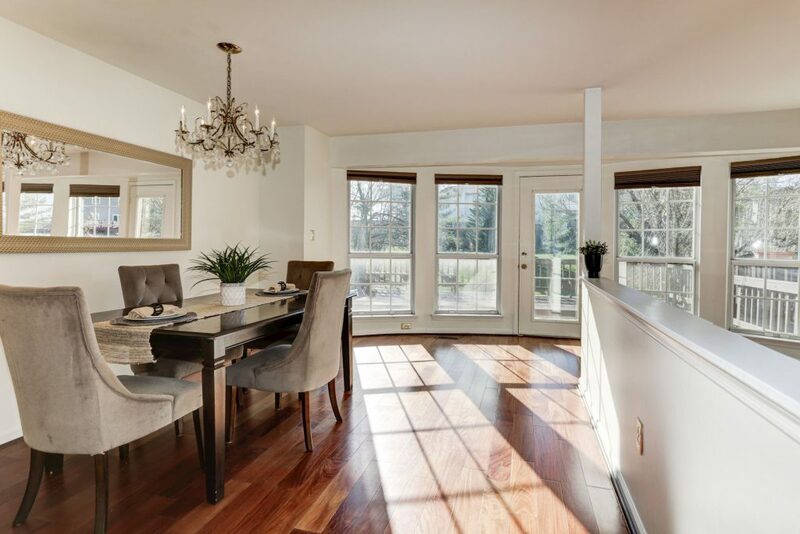 Once the house is ready for sale, your agent will hire a photographer to take pictures and post these pictures along with a property description in real estate databases. This will make the house visible on Zillor, Redfin etc. as a house on sale. Having appealing pictures is very important in generating interest and enticing people to visit your house. Staging helps a great deal in getting good pictures. The agent will organize open houses where people will come and look around the house. You don’t have to be present during these open houses. You negotiate with the buyer on the terms. Once the terms are agreed and signed by both parties, the offer becomes a legally binding contract. This contract lays out the contingencies under which the buyer may be able to back out, i.e., not buy the house. The contract also sets a time frame for settlement. The main contingencies are the home inspection and lender’s appraisal. Other buyers can now see that the house is on contract. They can still visit the house, but you typically can’t accept any more offers. The buyer hires (and pays for) a home inspector to inspect the house. These home inspectors are professionals who will look at every nook and cranny in the house and prepare a detailed report. The report outlines what needs to be fixed or replaced in the house. This is one of the most stressful part of selling the house, as the seller is waiting with bated breath what hidden skeletons the home inspector will uncover. Once the home inspection report is ready, you negotiate with the buyer what you will actually fix/replace. This of course depends on market demand and how much a particular buyer wants your house. If you received multiple offers on the house, you are in a stronger position and may only agree to fix a small number of issues. In my case, I only had one offer and I was losing money every day I owned the house so I agreed to fix most of the issues in the home inspection report and offered a credit to the buyer for the rest. I was quite relieved when the buyer accepted the offer. It is important to establish good faith with the buyer at this stage, it’s not advisable to haggle on every last fix or dollar. If you hire a general contractor to perform the repairs, the incremental cost of each repair is usually small anyway. You hire contractors to fix the issues you agreed to fix. In parallel, the buyer’s lender will order a home appraisal. Appraisers are also professionals who examine the condition of the house and sale price of comparable properties in the area to determine a fair market value of the house. This is important for the lender as the lender is lending money that is backed by the asset value of the home. You hope that the appraised value is greater than or equal to the sale price of the house. If not, this may create difficulties for the buyer to get a loan and you may need to renegotiate the selling price. The appraiser may also point out other issues in the house, which you have to fix because that determines whether the buyer will be able to get a loan from this lender. In my case, the house was appraised to the selling price, however the appraiser pointed out a few minor issues that I also had to get fixed. Once the appraisal is done, you are almost there. Your agent will work with the buyer’s agent to identify a title company that takes care of the paperwork involved in transferring ownership of the house and recording it with the state and pick a settlement date when the buyer and seller will sign the final paperwork. The main thing you need to ensure before settlement is that the title company can get a payoff letter from your lender that specifies the amount needed to pay off your loan. Because interest is due daily, the payoff letter is only valid for a few days and can only be requested a couple of days before settlement so that it is valid on the settlement date. This caused some anxiety in my case as the title company was expecting to get the payoff quote quicker than my lender was able to provide it. A day or two before settlement, the buyer will do a “final walk through”. All of your stuff should be out of the house at this point and this walk through is a chance for the buyer to see the house empty, as they will find it on move-in. The buyer also verifies that all the stuff you promised to fix has actually been fixed. At this point, the buyer has some financial and emotional investment in the house, so you hope that they won’t be too nitpicky. This caused me some stress as I wasn’t sure what would happen if the buyer throws a fit and makes an issue out of an insignificant detail. Can they back out at this stage or delay the settlement? What are the legal protections for the seller in this situation? My agent told me this rarely happens, so its nothing to worry about, but still this is an open question for me. You show up on the date of settlement, sign the papers and hopefully there is some money left over for you after your mortgage is paid off and the various commissions and fees have been deducted! The timeline below shows a summary of these steps. For the buyer, steps 5-12 are similar, except you are on the other side of the contract. Instead of steps 1-4, you spend time looking at houses and identifying ones that meets your needs. You put a contract on the ones you like, specifying the price you are willing to pay, how much closing help you need etc. If you are operating in a seller’s market where you expect the seller to receive multiple offers and you really like a particular house, you can include an escalation clause that says “I will pay x price for this home, but if the seller receives another offer that’s higher than mine, I’m willing to increase my offer to y price.” This can be tricky as it exposes your willingness to pay to the seller, but may be required in a hot market. If you are a first time buyer or seller, this all can seem complicated and daunting. Having been both the buyer and the seller, I’d say the system largely works. Since buying a house is the biggest investment most people will make, the system is designed to ensure that a buyer doesn’t end up with a lemon of a house (this is ensured by the home inspection) and that the lender doesn’t originate a loan greater than the market value of the underlying asset (this is ensured by the appraisal). When you are selling, it may seem that the system is biased in favor of the buyer – this is because the buyer is taking on an obligation, while the seller is getting rid of one. Let’s now look at the transaction costs involved in a real estate transaction. This is an area that differentiates a real estate transaction from other financial transactions such as buying or selling a stock or bond. Unlike more liquid investments such as stocks and bonds, real estate transactions involve significant transaction costs. In each home sale, ~8% of the sale price goes towards transaction costs. The biggest component is buyer/seller agent commission. This typically ranges from 5-6% and is split in half between the buyer and seller agent. About 2% goes towards state government recording and transfer charges, various document preparation, loan origination and underwriting fees etc. The seller’s side of the ledger is relatively simple with the buyer and seller commission being the biggest line item. The seller pays both the buyer and seller commission. This arrangement hides the commission cost from the buyer making it seem like a good deal for the buyer, but of course the reality is that commissions simply raise the purchase price for the buyer as the seller will try to account for the commissions he would have to pay by raising the house sale price. This can only be done if market conditions permit of course. The buyer’s side is much more complicated with several items related to the mortgage issuance, setting up an escrow account for homeowner’s insurance, real estate taxes etc. A first time buyer will sometime hear about these items during settlement as the title attorney is going through them. It was interesting to watch the expression on the buyer’s face change from excitement to bewilderment as they signed one paper after the other. Title companies charge different amounts and the buyer can shop around for one that is more cost effective, but first time home buyers probably rarely do as they don’t know much about these issues and it is difficult to do an apples to apples comparison between title companies. In some ways this is similar to the lack of transparency in the health care delivery market, where it is next to impossible for a consumer to compare the cost of a procedure across hospitals. The Economist has an interesting article about this issue. Identifying a good home inspector, which is very important. Once the home inspection is done, negotiating with the seller to identify which issues will be fixed by the seller and obtaining credit for the rest. Identifying the settlement company for final settlement and ensuring that proper financing is secured, home appraisal is done, issues found during home inspection are fixed etc. Helping the seller set up the house for sale. This involves helping find contractors to fix issues outside and inside the house, finding stagers if needed etc. One general contractor recommended by Sara was super helpful. He did excellent work at a relatively low cost, and was able to fix things at a short notice. Posting the house for sale on the real estate network. The agent will also put up a sign outside the house indicating the house is on sale, and hire a photographer to take pictures of the house and post these pictures along with a property description in real estate databases so that your house will show up on public websites such as Zillow and Redfin and can be found by buyers. As you can imagine, taking good pictures is very important to attract attention from buyers and entice them to come see your house. Holding periodic open houses where interested people can see the house. The agent will also put up a lockbox on door and provide access to the lockbox code to other agents, so they can show the house to interested buyers at will. This way, interested parties can see the house without the seller or the seller’s agent being present. If the seller doesn’t live in the house, this can be a valuable service and can save many trips to the house in the middle of a work day. Since real estate agent accreditation is well regulated, the seller can rest assured that people coming to see the house are legitimately interested buyers, not random people. The rest is similar to services offered by the buyer’s agent. When an offer on the house is received, the seller’s agent will help with contract negotiation and then with final settlement. Agents provide a valuable service and need to be compensated for their time and effort. Furthermore, an agent doesn’t pocket the entire 2.5-3% of the real estate transaction. This amount is shared between the agent’s broker and the agent. The specifics of the arrangement between an agent and the broker depends on the experience level of the agent and probably a host of factors and varies widely. Another factor to consider if you decide to go without an agent is how not to turn-off buyers or sellers with agents. By acting as your own agent, you can only save half of the agent commission, you’ll still have to pay the commission for the agent on the other side of the transaction. This applies when you are the seller because the seller pays the buyer’s and the seller’s agent commission. If you are the buyer and decide to be your own agent, then you may be able to negotiate a lower purchase price as the seller will save money on buyer’s agent commission. If you are looking for buyers/sellers also without agent, then your pool of buyers/sellers will likely be a lot smaller. Talk to someone who has done this successfully before you try to go without an agent. This being said, I think the whole real estate transaction system is ripe for reform. It shouldn’t be so complicated and should cost less. There are some alternative business models emerging such as OpenDoor and agents fees have come down from 6% to 5%, however there is still a lot of room for improvement. In this section, I’ll outline some practical realities around home ownership, ranging from those that are well known to the ones that only become apparent when you actually own a home. When you are renting, people will often tell you, “paying rent is throwing money out of the window”. This is true in the sense that you are not building any equity when you are renting. Keep in mind though that most of your mortgage payment is not building equity either. By this I mean that only a small portion of your mortgage payment goes towards lowering your principal balance on the mortgage. The rest consists of the following components – mortgage interest, real estate taxes, homeowners insurance, HOA fees and private mortgage insurance (PMI). Let’s go through these one by one. 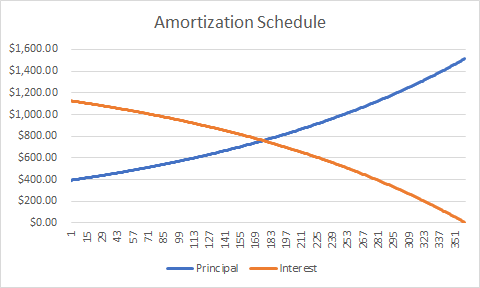 , where is the principal amount, is the rate of interest (monthly) and is the payment period. In this example, the “crossover point”, i.e., the point after which your interest component exceeds the principal component occurs roughly at payment period 180, so after 15 years. This depends on the interest rate, if the interest rate is higher, the crossover point will occur later. The main point to remember is that for many years after the origination of the mortgage, the bulk of your mortgage payment is going towards interest, which doesn’t reduce your balance owed. One benefit of paying mortgage interest is that it is tax deductible. Under the tax reform passed in 2018, you can deduct interest from mortgage debt up to $750,000. Assuming a tax rate of 30%, this will save you 0.3*1200 = $400 a month in taxes initially. This amount will come down as the interest portion of your mortgage payment reduces over time. Real estate taxes: Many first time home buyers don’t think about this one. I certainly didn’t when I bought my house. These taxes are usually levied by the county in which you reside and range between 1-1.5% of the appraised value of the home (not the price at which you purchased your home). So for the example considered earlier, real estate taxes amount to $3900 per year (at a tax rate of 1.3%) or roughly $325 a month. This is a recurring payment and will need to be paid as long as you own the home (unlike the mortgage payments, which stop once they house has been paid for). These taxes can go up or down depending on the appraised value of the house. These appraisals are done by your county every 2-3 years. The appraised value can be challenged if you think it is too high. I did this once the financial crisis hit and the home values in my area plummeted. Decline in home value is usually bad news for homeowners, but at least you can make a bad situation a bit less bad by saving some money on real estate taxes. Real estate taxes are also usually tax deductible, so assuming a tax rate of 30%, you’ll save ~$100 a month in taxes because you are paying real estate taxes. Homeowners insurance: You are required to purchase homeowners insurance (not sure if this is a state law or requirement from mortgage lender). This will cover your home in case of a fire, natural hazards such as hailstorms etc. Homeowner’s insurance generally doesn’t cover external flooding, so if your home is in a flood prone area, you should buy separate flood insurance. The cost of insurance probably varies widely, in my case the annual premium was about a 1000$. I purchased homeowner’s insurance through Geico, which is also my car insurance company. I used homeowner’s insurance once, when the roof and siding suffered some damage during a hailstorm and the insurance paid for a new siding and roof repair. Private Mortgage Insurance (PMI): Generally, if you put less than 20% down when you buy a home, your lender will require private mortgage insurance as part of a conventional loan to protect them in case you end up in foreclosure. PMI is a layer of protection for lenders, but an added expense for borrowers. Since I put less than 20% down when I bought my house, I had to pay for PMI. The monthly PMI payment was ~$130. As you build home equity by making mortgage payments, and/or your home appreciate in value, you can request your lender to cancel your PMI if you believe you have built sufficient home equity (i.e., outstanding balance on the mortgage is less than 80% of the appraised value of the house). Your lender will perform a home value appraisal and if you have indeed built up sufficient home equity, will cancel your PMI. In my case, since I bought my house at the peak of the housing bubble, home values crashed soon thereafter and I was never able to build up enough home equity and therefore always had to make PMI payments. Homeowners Association (HOA) payments: Most homes are part of a home owner’s association that takes care of general upkeep of the neighborhood and ensures that residents mow their lawns, maintain the exterior of their homes etc, so that the neighborhood looks neat. Some HOA’s also have regulations on what modifications you can make to the interior/exterior of your home. These regulations are set by agreement among HOA members, who are residents of the neighborhood so you should participate in the HOA meetings if time permits. This is also a good way to get to know other people in the community. HOA fees vary widely and have a tendency to creep up every year. In my case they started from ~$40 a month and landed at $54 a month when I sold the house. Note that if you purchase a condo, then you’ll need to pay condo fees instead of HOA payments. Condo fees go towards the maintenance of the condo building. These fees are a lot higher than HOA fees (usually ~$500 or higher) because they save you the expense of maintaining the condo building. Let’s add up all these charges. We’ll again use the example considered earlier – $300,000 borrowed at 4.5% per annum for 30 years. Your total monthly payment will be: $1520 (interest + principal) + $225 (real estate taxes after tax deduction) + $130 (PMI) + $55 (HOA fees) + $100 (homeowner’s insurance per month) = $2030. Out of this, you save $400 in taxes per month because of the mortgage interest deduction, so your net payment is $1630. Out of this, ~$300 is going towards building equity and lowering your principal balance and $1330 is still “money out of the window”. If you buy a condo, this “money out of the window” component is a lot higher due to higher condo fees. Also, keep in mind that some of these payments (real estate taxes, HOA fees, homeowner’s insurance) need to be paid as long as you own the home. There are many stories of people who can’t afford to pay real estate taxes anymore because their home values have appreciated so much that the taxes are now a significant portion of their monthly expenses. These are again expenses that people generally don’t think about much when they buy a house. Regarding utilities, the biggest surprise for me was the electricity bill. Houses have a larger surface area and tend not to be as well insulated as apartments. A lot depends on how old the house is, type/quality of insulation, whether the windows are single or double paned etc. Generally, the heating/cooling bills are going to be lot higher than what you may be used to, particularly if you live in an apartment building. I was averaging around $350 a month for electric bills. Home repairs is another joy that comes with home ownership. The interior/exterior of the house needs to be maintained, appliances will periodically break down and will have to be fixed/replaced, heating/cooling system needs maintenance, vents have to be cleaned, etc. I probably averaged $3000 a year in home repairs. These expenses will rise steeply when you are thinking of selling the house and need to spruce things up. Also, the home inspector will likely find issues you didn’t know about or were putting off and will now have to be fixed. I spent$10,000 in home repairs before I sold the house. In this section, we’ll consider two questions – first, based on historical trends in the last 40 years, what is a reasonable rate of home price appreciation? second, given the transaction costs, how quickly can you sell your house and not lose money? 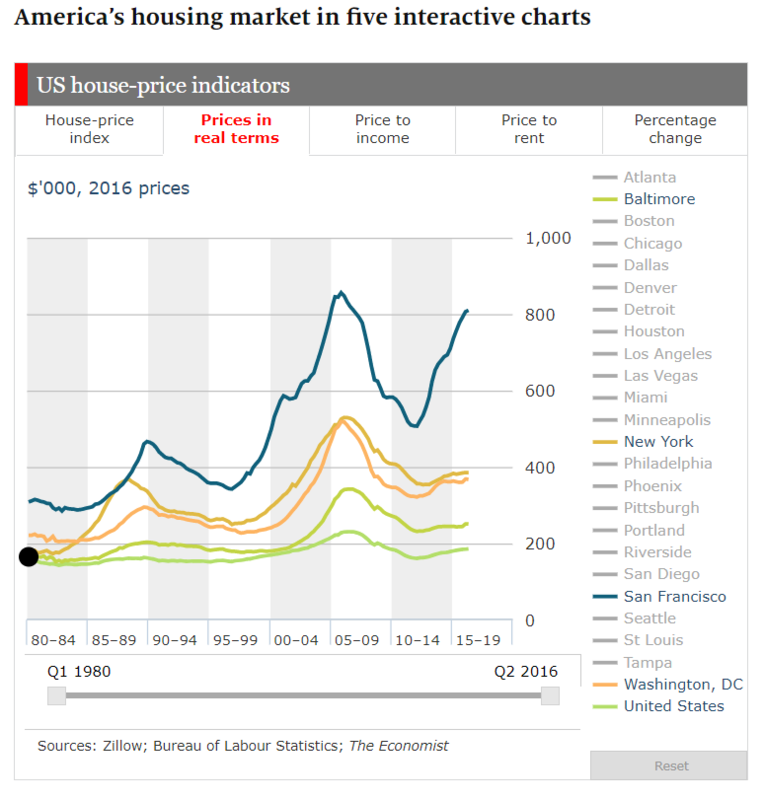 The chart below (source: https://www.economist.com/graphic-detail/2016/08/24/american-house-prices-realty-check) shows housing prices adjusted for inflation in 2016 prices. Adjusted for inflation, average housing prices across the nation (the green curve at the bottom) have risen by barely 12%. This amounts to 0.3% over inflation per year. Prices in 2019 are still almost 20% lower than the peak reached ~2016. Prices in superstar cities such as San Francisco, New York and Washington show much wider swings than in less vigorous parts of the country. It is clear that unless you believe that you can time the housing market, you shouldn’t expect housing prices to increase by much more than the rate of inflation. With this information, how many years will it take for you to break even? i.e., if you sell house you won’t lose money? Let’s use the figures from the example above. turns out to be ~2.4 years, which is not bad. However, the number of break even years is quite sensitive to the rate at which your home value appreciates. If it fails to appreciate, then = 5.7 years, and if it depreciates at the rate of 1%, then = 7.5 years. In this calculation, I’m ignoring all the other expenses and savings associated with home ownership that I discussed earlier. $300(1+0.02x) – 0.08*300(1+0.02x)+4.2x = $300(1+0.02x). In my opinion, given how volatile house prices have been in recent years, it is no longer safe to assume that housing prices will keep pace with inflation. While making the rent vs. buy decision, people usually evaluate the amount of space they need based on their personal situation and then estimate how much it will cost to rent vs. buy. I feel that in this calculation, people often overemphasize the opportunity cost of renting – the money “being thrown out of the window” by not owning. As discussed earlier, a big part of this will still be “thrown out of the window” i.e not go towards building equity even if you own a home. That’s one consideration. A factor often not considered is the opportunity cost of home ownership. This cost is the opportunities missed by not being able to move – not considering that exciting job opportunity in another city, or the time wasted in the longer commute when you switch to a new job that is farther away than your old one. In this sense, the portion of the rent that is not going towards building home equity can be considered as the price of freedom and flexibility to move. People value this flexibility differently depending on their age, family situation, industry etc. For people in a stable job in a stable industry such as health care, finance or accounting, this flexibility may not be worth much as you don’t expect to move around that frequently. However for people like me in fast growing and dynamic industries such as technology, this flexibility is worth a lot. You may say, “I’m not really bound to a location when I buy because I can always rent my house and move”. While this is theoretically true, people underestimate the uncertainty and headaches involved in being a landlord. Renting a condo is a lot easier than renting a single family house. Renting a single family home to a family is a lot easier than renting rooms separately. It may not be possible to rent your home to a family or it may take a lot more time to find a good family. All the while you are searching for tenants, you still have to pay the mortgage and utility bills. As you can see with my own experience with renting, being a landlord is no easy thing. A lot depends on the location of your house and the quality of tenants in the area. This can all change in unpredictable ways for better or for worse. In the DC area, think about how the U street corridor and the H street area were a few years back. If you get stuck with a tenant who doesn’t pay rent or is disruptive and needs to be evicted, you’ll have to go through landlord-tenant court which (depending on the state), can be tenant friendly, putting you at a disadvantage. You can consider hiring a property management company, but they will charge their own fees and do not guarantee they’ll find you a tenant. If you move out of the area, then a property management company may be your only option. If you stay in the area and manage renting on your own, you’ll have to post ads, find and vet tenants, collect rent, resolve disputes, fix broken appliances and all the other joys of being a landlord. Being the owner of the house, ultimately you’re on the hook. Apart from the financial aspect, being a landlord will distract you from other areas of your life – your job, family, vacation time etc. This will bother some people more than others, but you should consider all these things when you make the rent/buy decision. You like the house, job, neighborhood, and house prices appreciate at a nice, slightly above inflation rate. This is the best case scenario. A price appreciation rate too much higher than inflation indicates an asset bubble, which is not good news. You like the house, job, neighborhood. House prices still appreciate, but lag inflation. You still build equity in the house by lowering the principal balance. The first and second scenario’s are obviously great. The third scenario is still ok, because you have equity in the house and can always sell (after a few years once sufficient equity has been built up to make up for the transaction costs). The fourth scenario is unlikely, but good to think through. The reasons for your move could be good or bad – you may have a great job offer in the same area or a different city or you may lose your job. Since the house price has dropped, you can either sell it at a loss or decide to rent it out. You should think about whether you are prepared to be a landlord, can you rent the house out as a unit or need to rent individual rooms, what will be your estimated rental income, do you have a support structure (friends/family you can trust) in the location in case you move to another city, how much does a property management agency cost etc. Running through these scenarios will prepare you for the future so at least you are not taken by surprise if things don’t turn out as expected. I happened to buy my house at the peak of a particularly acute asset bubble in an area that was specially hard hit by the downturn that followed. This is unlikely to happen to most people. However if I had run through a similar scenario analysis, perhaps my decision to buy would have been different. At least I wouldn’t have been as surprised by what followed. In this analysis, I’m not considering the many other joys that home ownership brings. Many people love having their own home where they can paint the walls, hang paintings, make home improvements without asking for permission, start a garden, have parties on the patio etc., that enrich their lives. These must be weighed against the responsibility of the owner to pay the mortgage, bear the cost of repairs, pay property taxes and hold the financial risk of change in home value. People will weigh these pros and cons differently. My advice is to think through these issues carefully before making your decision. Good luck on your journey of home ownership!